Putzing about the yard is one of my favorite things to do. 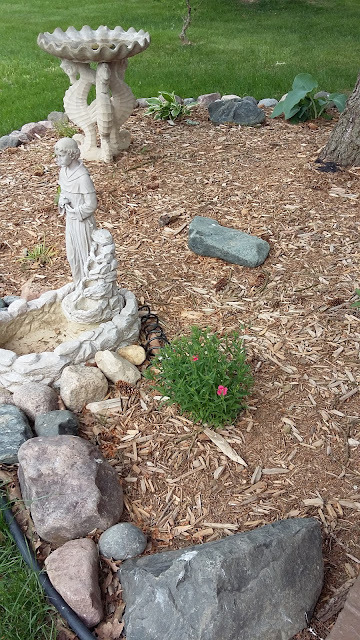 Walk around, listen to the birds, look things over, pull a weed here, water some flowers there, get startled by a chipmunk, notice how things are improving, consider plans for the future, feel the breeze, enjoy the shade, enjoy the sun, stop to watch a rabbit, pull more weeds, tidy up. My great-grandparents' kettle, which Grandpa turned into a planter. 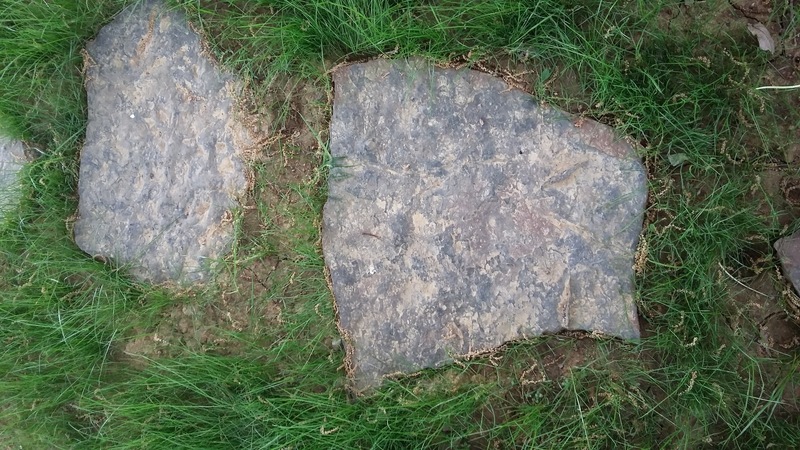 This was sooooo bad but I ripped out some old landscaping fabric + a great deal of grass that had grown on it, dug out a trench, lined it with the cleaned off landscaping fabric, and placed the rocks. I divided my mums and black eyed susans and added some day lillies that were given to me from a family friend. 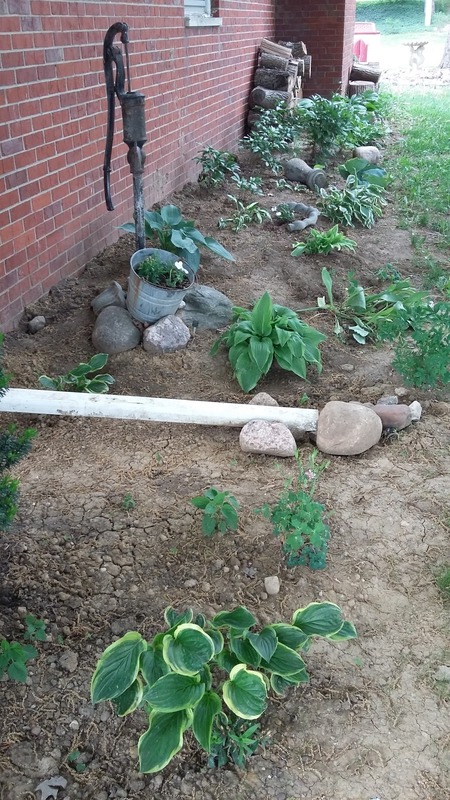 The corner off the porch, filling in nicely with transplanted lillies and all sorts of things I didn't plant. Shade garden in the side yard. Lots of hostas, peonies, and a bleeding heart too. Next year I'm hoping to add an edge and lots of brown mulch to this area. 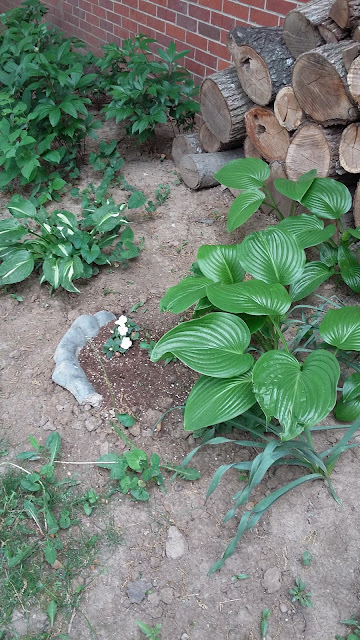 My aunt and neighbor gave me several hostas for this area and the same family friend mentioned above gave me a very small Rose of Sharon that I stuck here, too. Travis planted grass through here and it's so lovely. The stepping stones lead from the front to the back of the house, under our large oak and next to the shade garden. 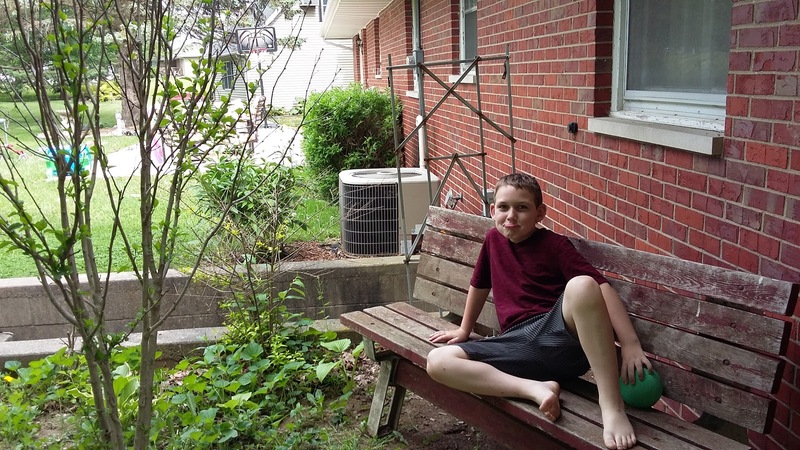 Remember who I wanted to bury the broken bird bath and then plant it like a berm? I think it looks good. This is the flower bed under the pine tree off our patio. The kids' playhouse is here, too, and I have been slowly filling it with hostas, divided from other people's yards. I found the pump for this fountain so I won't be using it as a planter any more and I'll finally have a water feature! The only problem is the basin has a few cracks in it. This was one of my two thistle patches, which I've cleared and made a strawberry patch. At least I hope that's what it will become. 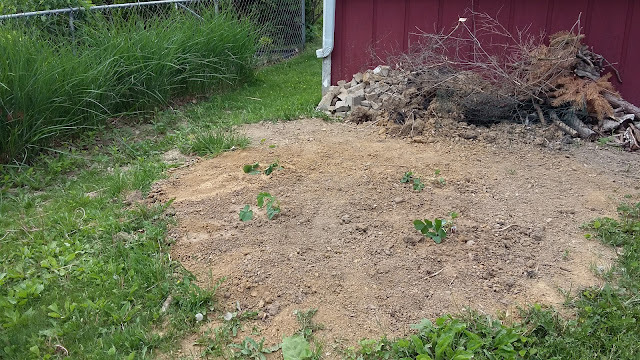 Strawberries are finicky and I've never succeeded in growing them... yet! I realize the pile of blocks and wood and fencing don't make this look so nice but I promise it's an improvement. 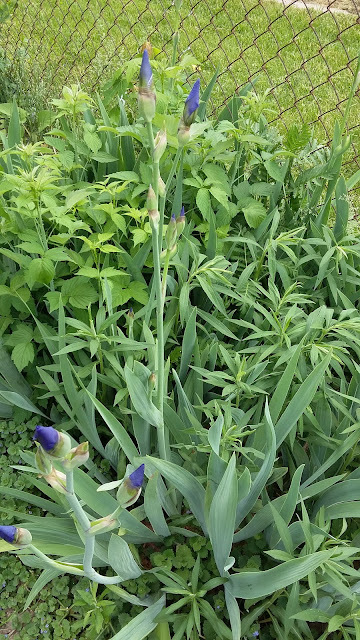 Irises, raspberries, and weeds, growing together along the fence. I want to move the irises to another part of the yard but didn't get it done in time. These grow along the fence too but I don't know what they are. Do you? Our vegetable garden. 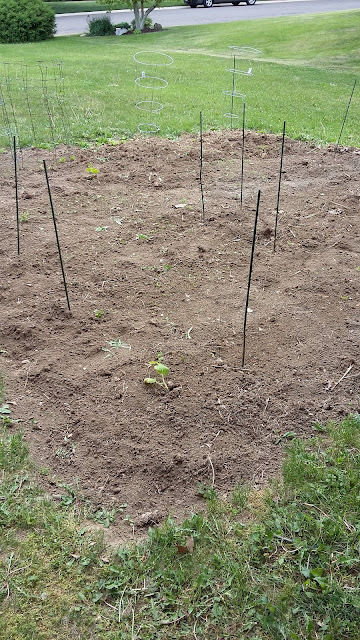 Cucumber, peas, beans, hops, peppers, broccoli, squash, tomatoes, and onions. I cannot wait to eat it's bounty. Bring it! Herb garden + a gooseberry bush and an elderberry bush. My little resting spot. The benches have since been painted but in May they still looked this sad. 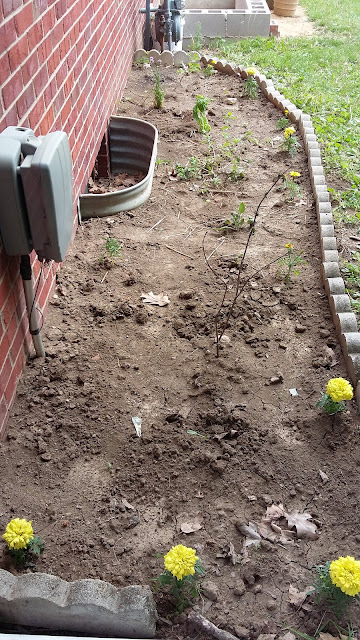 Resa planted morning glories to hopefully climb up the crooked trellis behind the bench, which would be so lovely. The look on JF's face cracks me up. What a goober! So that's it for today. There's not much else to see but I'll post again soon. Thanks for putzing with me and let me know if you know what those purple flowers are! Are the purple flowers lupines? They look like it to me! Also re: strawberries, pinching off the flowers & runners the first year (or until July, if they're the ever bearing variety) really helped strengthen the roots and make the plants bigger in our patch, and we got a great yield the first year! Thank you for that tip, Rosie! 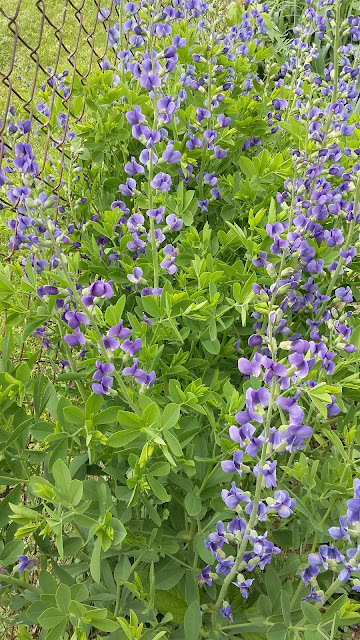 The blue flowers are Baptisia, or Blue False Indigo I believe.. So pretty! 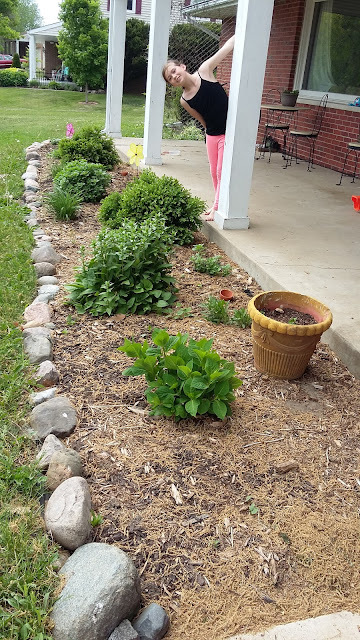 I was just explaining to my mom this morning that I enjoy planting quick-spreading flowers (peonies, shasta daisies, coreopsis, etc) because the need to divide regularly prompts so much extra putzing! And actually, I'm no expert on iris care, but I did just plant my first rhizomes this past fall... based on the fall planting schedule I believe fall is a better time to transplant them than spring so you might still be in luck for this year. But I'd double-check that advice before following! You are right-false indigo or Baptista. 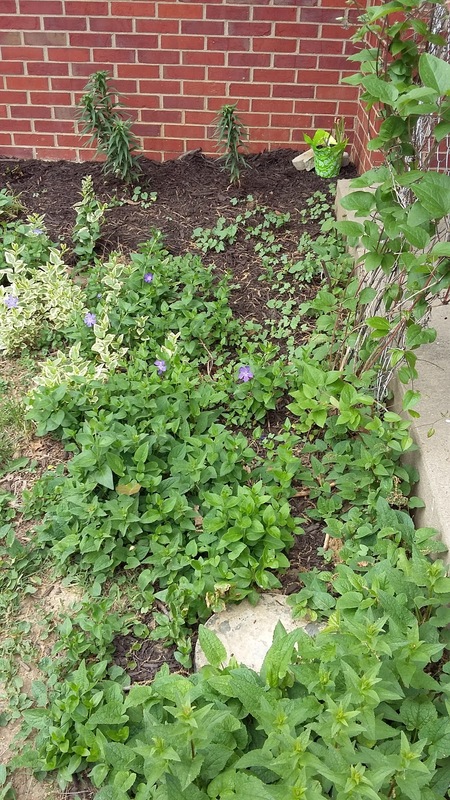 I transplanted mine last spring and they did ok. Baptista is a very resilient sturdy plant. 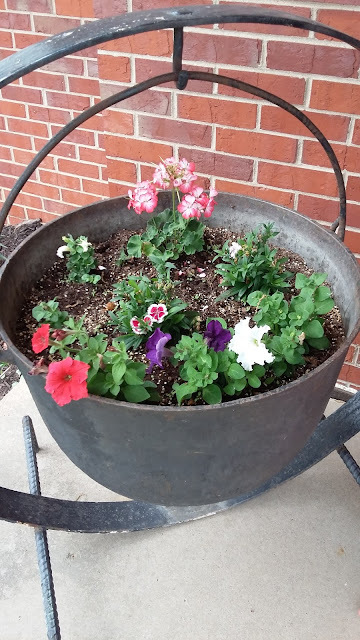 They didn't bloom much last year because the move shocked them. They look nice again this year. It is best to move fall-blooming perennials in the spring and spring-blooming perennials in the fall. You want to avoid moving plants when they are or are about to bloom.